Strawberries are yesterday’s news, because right now I am head over heels in love with cherries. I love all fruits, maybe as a compensation for my detest for vegetables, but the sweet, juicy cherry is one of my favorite. And right know they are starting to show up in every store, on very street. 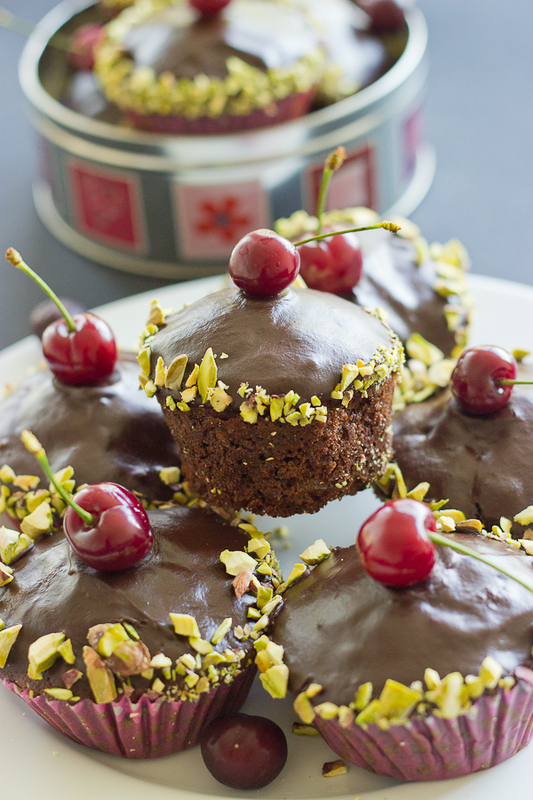 These Double Chocolate Cherry Muffins happened because we went to a cottage with friends last week and in situations like that I usually need something easy to transport and easy to eat, like with your hands. I was also short on time so being fast to put together also didn’t hurt. 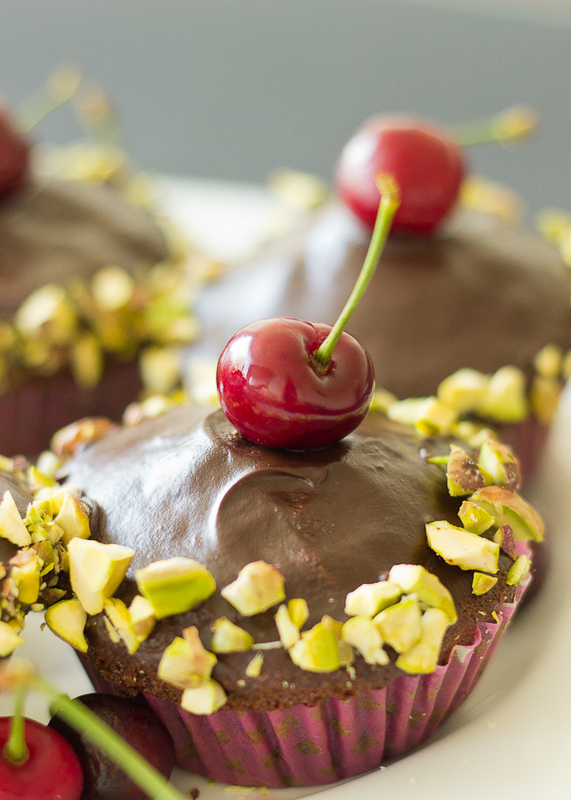 I don’t find it necessary to convince you that chocolate and cherries are a great match. I am not aware of a red fruit that doesn’t work with chocolate. 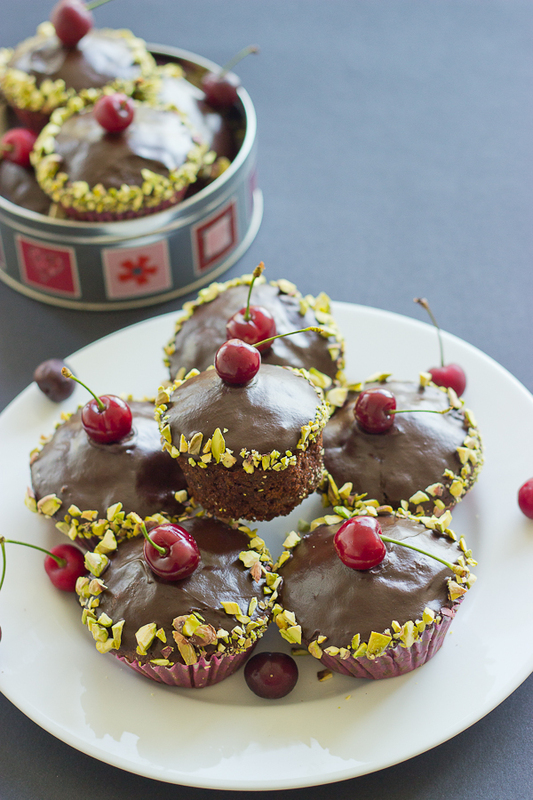 These Double Chocolate Cherry Muffins are filled with cherries and pistachios because I always want a crunch in my dessert. They are extremely addicting, succulent and flavorful, and also have a fancy look. A major bonus is that they are incredible easy to make and decorate. Give them a try if you ever need a posh and quick treat to share with your friends or just to spoil yourself. 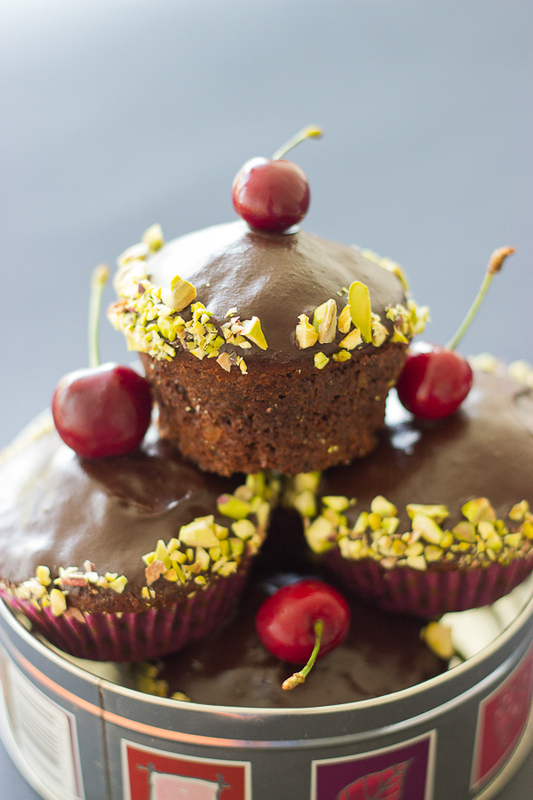 Succulent and flavorful, fancy looking Double Chocolate Cherry Muffins with the addition of pistachios for a really special treat. Line a muffin pan with baking cups and preheat your oven to 170°C/350°F. In a large bowl place the cocoa powder, flour, salt, baking soda and baking powder and mix using a wire risk. Cream the butter and sugar in a large bowl, using your mixer until light and fluffy, 3-5 minutes. Add the eggs, one by one, mixing after each addition. Add half of the cocoa-flour mixture and whisk until incorporated. Add the milk and mix. Add the remaining flour and beat until just incorporated. 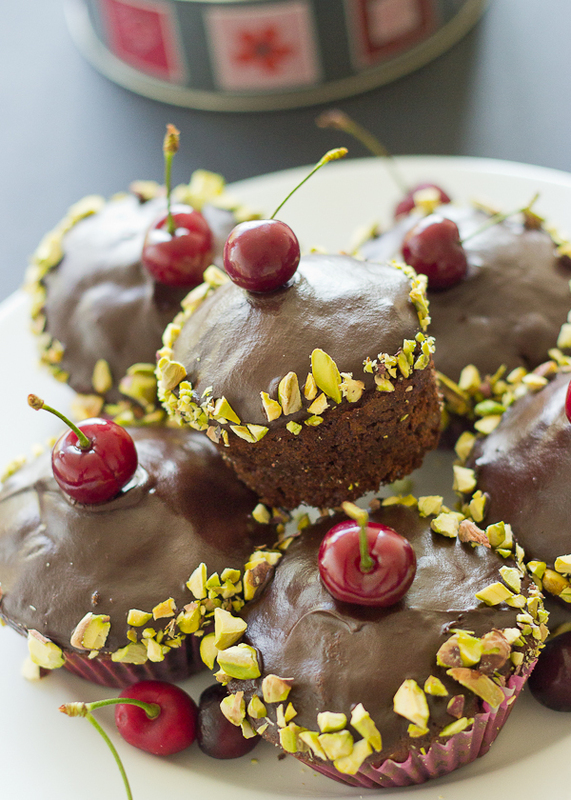 Add the pistachios, cherries and chocolate and incorporate into the batter with a spatula. Pour the batter into the muffin pan, filling it two thirds. Bake for 20 minutes and let the trey cool on a wire rack before taking out and decorating the muffins. For the decoration: Chop the chocolate and place it in a small bowl, add the honey and butter to it. In a small heavy-bottom saucepan bring the cream to a bowl. Pour the hot cream over the chocolate and let it sit for a minute. Mix using a spatula until the chocolate is melted and the ganache is shiny. Dip the top of each muffin into the chocolate ganаche and decorate with pistachios.